Crumbs and Cookies: peanut butter pretzel cookies. I have a confession to make: I used to scoff at soft cookies, chewy cookies, just any kind of cookies that isn't crunchy. I can hear you now. What? Has she been living in a cave? I know, I know. Just until very recently, I have begun to see the light. It all started with watching the chocolate chip cookie throwdown with Bobby Flay. His competitor? A very formidable giant, soft, with an almost raw cookie dough middle chocolate chip cookie from Levain in the NYC. Utterly inspired, I surfed the web for copycats despite of my aversion to soft cookies. I managed to find what seems to be quite a successful clone but I shall post about that another time. Darned show. I'm now fully armed with 4 packs of butter sitting in the fridge to fuel my sudden obsession with giant cookies. I had planned to make another batch of Levain clones but this sudden need kicked in. The need for the sweet and salty. So I thought: Hey. Why not use peanut butter and pretzels! I took a peanut butter cookie recipe from KAF and made my own little adaptations. Preheat the oven to 180C. I refrigerated my dough overnight and used 190C to make a tall cookie. Cream together your butter, sugars and peanut butter. But just until combined. Beating too much air in will cause the cookie to spread more! Add in the egg and beat it in, then the flour with the salt, baking powder and baking soda. Add in your peanuts/chocolate chips/peanut butter chips/pretzels. At this point, if you don't plan to refrigerate your dough, drop it by the tablespoonful onto prepared baking sheets. Bake for 14 minutes, until they're set and brown around the edges. To satisfy my need for giant cookies, I made a 100g cookie dough ball which I baked at 190C for 15 minutes and made the rest normal sized. Remove them from the oven and cool on the pan for 5 minutes, then transfer to a rack to cool completely or just dig in! Because I under baked them on purpose, my cookies were chewy and almost raw inside while the outside was crisp-crunchy. I let them cool on the rack for 10 minutes out of the oven to let the insides cool down a bit first. I have self control. Who knew? 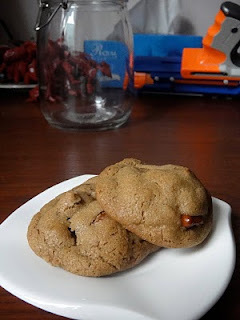 These cookies were nuggets of caramel-ly goodness though there certainly are other recipes out there which have a stronger peanut butter taste. But these are good. Very good. Take note: If you use pretzels pieces, they can soften up after a day or so, so don't let them sit around! double chocolate hard boiled egg cookies. levain chocolate chip cookies copycat #1.